I like and dislike seeing the pics of closed tracks. The history that took place at those hallowed grounds is fascinating. I still dream of Lakeside coming back to life. I miss those hot summer Sunday nights watching the coupes run. Please add your ghost tracks to this thread! Make sure to include a bit of information about the track, pictures of the track in operation and pictures of the track in it's current form. Check out my newly edited post, on the closing of Ascot Speedway. Cary Agajanian, son of truly legendary J.C. Agajanian, contacted me about the accurate story behind the end of the speedway. I have to tell you, Cary is one of the nicest most patient and friendly people I've had the pleasure to speak to. It was amazing to relive many memories of that wonderful track with someone so directly involved with such a historic speedway. You will never find anyone connected with motorsports who is as much a gentleman as Cary Agajanian. I was a great fan of his father, who befriended me one night at the Fairgrounds Motor Speedway in Louisville, and he is a credit to his father's memory. The Fairgrounds Motor Speedway at Louisville, Ky. Opened in 1961, closed after the 1980 season when the state fair board declined to renew the lease. Said they wanted to build horse barns on the site. 30 years later, I think it's still a parking lot. Practically lived there, much of the time as starter/flagman. The irony of the situation is, as I understand it, an audit later disclosed that the speedway was the only entity on the fairgrounds property which actually showed a profit for the state over several of those 20 years. This photo was taken after the expansion from 1/4 to 1/3-mile. I don't think you'll ever see another track built so close to a major city. With all the people there, it looks like they needed to extend the grandstands to have more seats. I always like to see that cross in the middle of the track. I hope someone has some of the pictures from when thr track was open and running to add to the "before factor"
I think there are several images of Century 21 floating around ARM in various threads. Here is a thread dedicated to the track. I was lucky enough to go there several times when I was a kid. It was a really neat place. 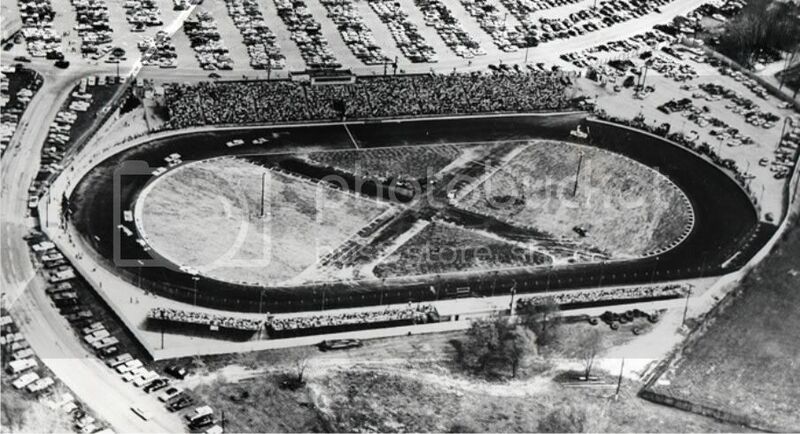 While we're talking about ghost tracks, how about the "old" Atlanta Motor Speedway? I know there's a 1.5-mile track there now, but it's a "cookie cutter" style track. They took one of the best tracks away when they reconfigured that oval. Not enough pure ovals on the NASCAR circuit now. I remember the first time ASA ran there in conjunction with CART. After I got up on the flagstand, Rex Robbins keyed his radio and said, "What's it look like, Potts?" I told him it looked like Salem with a thyroid problem.